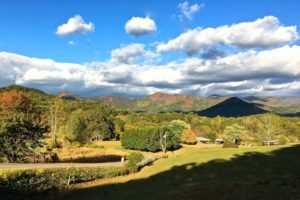 While life slows down for some when children are back in school, there are still many things to do during late summer and early fall in the mountains. Enjoy a delicious breakfast with us before heading out to explore our wonderful community. Return to relax in a rocking chair on our porch. Now is the perfect time to visit Your Home in the Woods Bed & Breakfast. We feel the first winds of fall weather up here in the mountains. The days are pleasant and the evenings are cool. The leaves are beginning to change color and will be beautiful throughout the month of October. There are festivals nearby every weekend. Roadside stands feature pumpkins, jellies, and boiled peanuts. Enjoy a delicious breakfast with us before heading out to explore our wonderful community. Return to relax in a rocking chair on our porch. Now is the perfect time to visit Your Home in the Woods Bed & Breakfast. 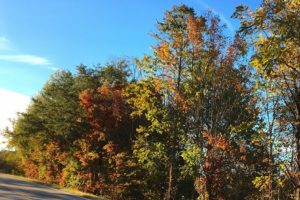 We enjoy cool nights and pleasant days in November up here in the mountains. The leaves have fallen from the trees so we can see further into the woods. Hiking is a pleasant experience, whether easy or challenging paths are chosen. 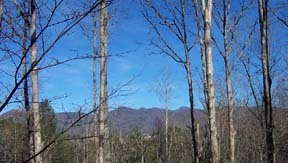 The ridge of mountains on the other side of the valley is visible from our porch. Enjoy a delicious breakfast with us before heading out to explore our wonderful community. Return to relax in a rocking chair on our porch. Now is the perfect time to visit Your Home in the Woods Bed & Breakfast.